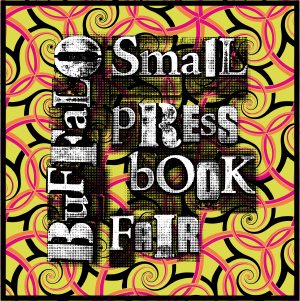 The Buffalo Small Press Book Fair is a regional two-day event that brings booksellers, authors, bookmakers, zinesters, small presses, artists, poets, and other cultural workers (and enthusiasts) together in a venue where they can share ideas, showcase their art, and peddle their wares. The 2016 event will take place on Saturday, April 9th from noon to 6pm AND Sunday April 10th from 11am-5pm at the Karpeles Manuscript Library Museum, Porter Hall, 453 Porter Avenue, Buffalo, NY. Remember this event is FREE and open to the public! Get directions to the event. If you are in the neighborhood, come check it out!